This is choice uncirculated example of a 1928 silver Peace Dollar from the Philadelphia mint. It has good luster on both the obverse and reverse with clear fields devoid of any major marks. It has a normal strike and is full silver white in color. The Silver Peace dollar was minted from 1921 to 1928, and again in 1934 and 1935. It was Designed by Anthony de Francisci. its obverse represents the head and neck of the Goddess of Liberty and the reverse depicts a bald eagle at rest clutching an olive branch. It was the last United States dollar coin to be struck in silver. The United States Mint was required to strike millions of silver dollars with the passage of the Pittman Act of 1918 and began doing so in 1921 using the Morgan dollar design. Coin Collectors (i.e. numismatists) began to lobby the Mint to issue a coin that memorialized peace at the end of World War I. 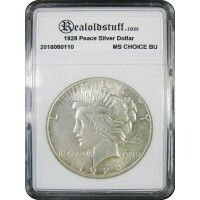 Although they failed to get Congress to pass a bill requiring a new design, they were able to persuade government officials to take action and the silver Peace dollar was approved by the Treasury Secretary in the final month of 1921. This is choice uncirculated example of a 1928-S silver Peace Dollar from the San Francisco mint.&nbs..